Anyone who has ever managed a business knows how difficult it can be to keep track of new employees. Remembering who has been trained, who still needs it, and where they are in training can be a full time job in itself. 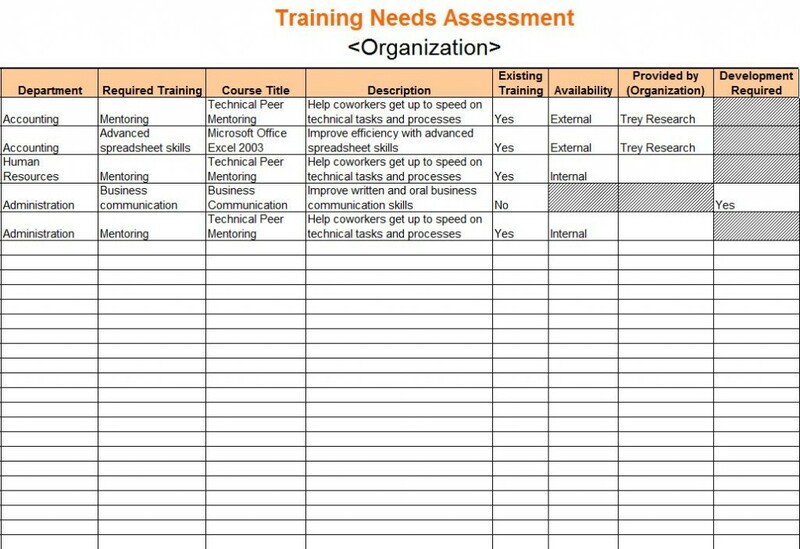 With this Training Needs Assessment template, all information will be kept neat and organized. Having everything in one spot will make everything go smoother. Download the training needs assessment template for free today! After you download the free document, you can open it as an Excel document. You can easily edit the boxes to say anything you need. You can change the columns and rows any way you want. You can also add more if you need to. All you have to do is click on one of the boxes, and type in whatever you need. After you finish editing you can save the new document to your computer, or print it out if you need to. If you are unsure, the best thing to do is download the training needs assessment right now from this page. It is completely free to try, and after you open it you are sure to love it. There are a few things that would make using the training needs assessment even better. After you download it you should start editing it. I would add in a column in there for employee name. Put in the name of your new employees, and just start filling out the boxes. Put in your new employees position, the training they need to do next, the description, and whatever else you need. The biggest key to using this successfully and making your job easier is to keep up with it. Every time one of your employees completes a section of your training program, you should change it to the next one. That will keep everything organized. After they have completed all their training, you can either delete their name from the list, or cross them off. There is nothing really complicated about this training needs assessment. Just stay on top of things and you will find out how much easier this makes your job, and you will probably even recommend it to all your peers.